Well yes. It's been believed to be good to praise kids for their smartness. It is believed to be boosting their self-esteem. What happens actually though? Read through the dialogs to know some amazing insights based on latest research. - Hell yes! My Kid is smart…may be the smartest of the lot!!! He remembers everything. - He is in level 7 of COC (Of those who don’t know what COC is, you need to talk to your kids more!). - She loves Maths and always scores an A+. - The Science project he did got 3rd prize. He is super, he studies just before exams and still scores an A! Oh yes, he/she is SMART!!! So how do you praise him/her? - Just like everybody else. Saying good things in front of him. Making him feel good about himself. - Taking her out on dinner. Movie, pop corn, ice creams. - Buying a personal cell phone or tablet. Gifting him aids that he can use like pens, colours. - It feels so good when we see them happy and content! They love us more when we reciprocate and celebrate their success!!! And how do you talk to them when they make mistake? - Well, I am generally soft. I tell him how he made a mistake and that he is a smart boy. He should pay more attention. - We need to let them know that they are making mistake! So I tell her in as many words. AS MANY words so that she doesn't make the same mistake again. And yes, it works…she mostly doesn't make the same mistake again! - My feedback is constructive, I tell him that he can do better. He is smart! It helps boost his confidence. Well...we all need to re-think about this strategy. A huge research is done around how to praise kids and what are best ways to do it? When we praise kids for their “smartness” or “Intelligence”, we supposedly build their self esteem. But at the same time, we give them their self image to live up to. We tell them, “You are smart! (And unsaid expectation or communication is - we will appreciate whenever you do an act of smartness. Isn't it?). We in a way tell them “Don’t do anything that makes you look stupid!”. We in a way tell them “DON’T TAKE RISKS!”. We start limiting them. It was observed that kids who were appreciated for smartness showed significant drop in resilience, persistence. Why? they were a little afraid to fail. They were thinking that the challenge in front of them is too big for their smartness. Really!!! Through the research done on Tens of THOUSANDS of kids by Carol Dweck, it is observed that when you praise kids for their hardwork they start enjoying the process. The better way to praise kids is for their efforts and not Intelligence. Praising for efforts makes them believe that with their efforts they "can control" the outcome. While for smartness which is abstract and inherent for them, they give up quickly and don't keep trying. Makes sense? Also, remember to always praise them for real efforts, where you have seen them putting in sweat. Does it mean success should go unappreciated? No, it doesn’t mean success shouldn’t be appreciated. It just means a lot of emphasis should be put on efforts than the outcome. When they succeed they always feel that it’s because of the efforts that they have put in, they are successful. How does natural talent play a role? Natural talent does matter and each kid will have it in them in different areas. However all of us will agree that the talent is less important, it’s what you do with that talent is important. Somebody who is exceptionally good in football can go waste if he doesn't practice regularly and complete his physical fitness regime and so on. Isn't that true and isn't that something we have seen in our lives? - - Wins a prize in project competition: "Hey, congratulations! you really worked hard at it!" - - Doesn’t win a prize in project competition: "I really liked the efforts you have put in to complete the project!" - - Scores well in Olympiad exam: "Beautiful job! I saw you studying regularly." - - Doesn’t score well in Olympiad exam: "I think you put in efforts. You can see where you need to improve and I am sure you will do better next time." I hate history and I have the exams tomorrow! Been 2 hours I am studying but I don’t remember anything! I have so much to complete. How will I ever be able to do it? I never could stick to my study schedule! No point in making one. All the above dialogs are common and believe me, it’s natural to feel or think so. Each one including your parents, grandparents, teachers have faced similar issues! They have gone through all this - happily or sadly. Yes, You know what? Your brain and mind is crazy! It requires a little discipline to be able to use them optimally. Just a little discipline and you probably can study more in less time and enjoy more playing. How? Follow the Pizza technique to study. Study like eating a Pizza! Set aside a SET time every day for studies. Say 4 PM to 5 PM or whatever works with you. This time is for studies and at this time, it’s just studies and nothing else. Study in the blocks of 20 minutes each. 20 minutes is a good duration to study focused. 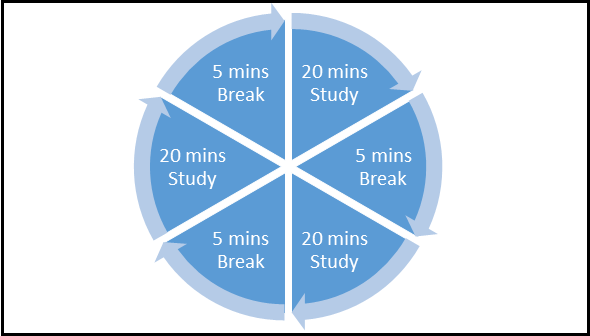 Take short breaks (5 mins) after every 20 mins focused study time. Rehearse and Revise – Repetition is a mother of learning. Crap! What's the guarantee it works? Setting aside a fixed time every day, ensures your brain gets into a habit of learning during that time. It's like we get up every day at the pre-decided time. Researchers have found out that 20 mins is the best time to keep brain focused. This duration can go up by practice but 20 mins is good to start with. You can choose to do anything during break, just don’t engage into activities that don’t end in 5 mins. E.g. you start playing a game which you kept on “pause” as break ended. Now while you are on the next subject, half of your attention is on remaining game! Play games those end within 5 mins. Hear music, read story book, watch cartoon, eat or whatever that you enjoy and can end within 5 mins. Have you seen rechargeable batteries? How do they work? You recharge them once they are exhausted, right? The 5 mins break does the same things to your brain. It recharges your brain cells for next 20 mins study time. It works wonders to remain focused!!! 1. 20 mins study is “focused” study. No distractions and only study. 2. 5 mins break is a “focused” break. Do what you enjoy during this time. This is one of the most easy technique you have heard. Isn't it simple? Would love to hear you comments and feedback. 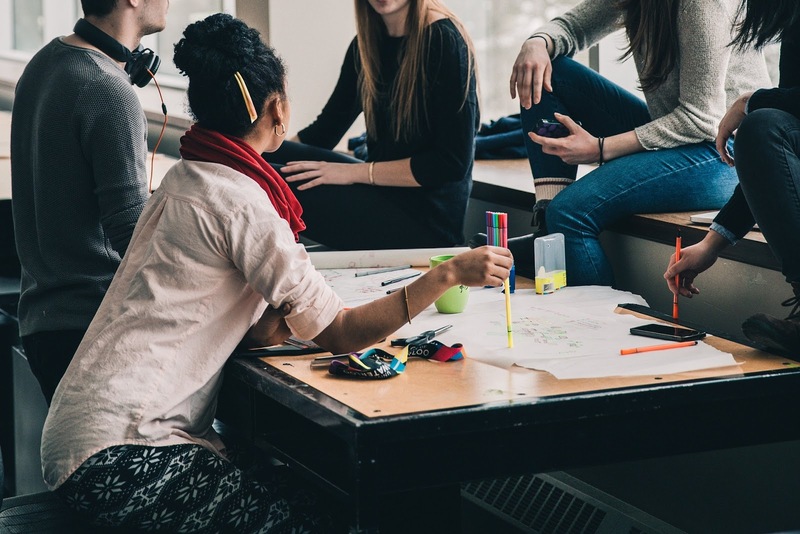 2 unbelievably simple but smart ways to study with friends! Hey, So you are all set for a study time along with your study buddy? It's cool to be able to study with your friend. Chips for munching, coke or coffee, couch or bean bag just makes up the mood. If there are 2 or more than 2 friends together, that's even better. Studies are enjoyed a lot more when you have a friend or a group of friends with you. Isn't it? We absolutely agree that it's fun and we want it to remain a fun. That's the best way to get the most out of your studies. The issue is when the purpose of studying together is defeated. Do you know, there are two unbelievably simple but really smart ways to study together with friends? "STUDY" together or study "TOGETHER". Didn't get it? Come on, you got it. - STUDY together - Goal is to spend some time together studying individually. Agree and decide on rules - Time to study, time for breaks, time to talk/discuss, time to eat etc. Read the "Pizza Technique" to understand more around how can you schedule your study times. - Study TOGETHER - Objective is to understand a topic better by discussing it with friend. R - Read. Read and try to understand yourself whatever you want to discuss. D - Discuss. Discuss and exchange your understanding about a topic with friend. Let him/her do it too. X - Xpress. Once the topic is understood, express your understanding by drawing, writing. Avoid Q&A and rather focus on understanding the concept. You can answer any question once you conceptually understand a topic. Imagine somebody asking you a story of Harry Potter and the prisoner of Azkaban or Game of thrones. You may talk for minutes! Why? because you have understood it better. Remember - Learning is "recreating". While you will use D - discuss to recreate, X - Xpress should be used with "writing" and "drawing" and not just "talking". Finally and most importantly, you know there are different kind of friends. Some are your study friends and some are your fun friends. Some are your TP friends and some would be your hi-bye friends. Always remember the purpose of Studying together. It should help both of you. So stop if it doesn't. "But how can I do it to my friend?" - Let's address it in another blog post. Until then - have fun while studying! How do we ask our kids to learn today? How do you learn? Are you still hooked on to old style of mugging up or writing questions and answers? Read through some latest research and learn to spend less time and study more effectively. How does an effective learning happen? University of IOWA figured out that brain processes auditory information entirely differently than visual or tactile! Visual images tend to have more things that we instantly associate with them. These connections make information more “memorable”. Auditory experience is forced to recreate the visual representation and then associate it with what we know. Same is the case with “reading”. This exercise of recreating the visual representation is longer and cannot happen on the fly as we hear or read. A complete learning experience is when multi-sensory experience in involved. It helps store, process and re-create what is learned a lot effectively. Thus it’s essential to combine hearing/reading experience with visual and/or tactile experience to have the most effective learning experience. Scientists did an experiment several years ago. A group of people was introduced to a woman and told her name was Mrs. Baker. She was then wearing a casual outfit. Same woman was introduced to another group of people and was told that she was a “baker”. She was then wearing baker’s cloths and outfit. Several days later, both groups were asked who they had met and second group did 70% better than first group. Why? Because they could relate to her occupation better. Images of floor, cakes, cooking built connections in the memory and ensured a better recall! There are three types of learning styles. The visual learners are visually stimulated (predominantly) when it comes to subjects of learning. Diagrams or illustrations aid visual learners the best. They are the biggest group and make up about 65% of the population. Second type of learning style is auditory. Auditory learners are able to understand subject through auditory medium or discussion with other individuals. They will read the text book aloud to understand it better. They make up to 30% of population. The third type of learning is kinesthetic or tactile. These types of learners engage themselves physically by touch or other sensory organs to learn a topic. Do you try to remember certain topic by closing eyes? It is an attempt to visualize what you had learned, trying to create a picture, build a map and imagine! Our brain works on references and associations and once they find an associated fact, you are all set! Know that visual memory is strongest of all types of memories, yet we rely on it so less! We are caught in the midst of traditional ways and means of learning. We want children to “listen” to a class teacher. We still want them to know Q&A by heart. We ask them to rehearse the spelling. Many times the class teacher may also just “speak” and won’t use visual aids to “enrich” the experience. Visual aid doesn’t necessarily mean – eLearning always. Visual learning could be by using hand drawn images, charts, flowcharts, pictures etc. The richer the learning experience the better is the information absorption and retrieval. Remember, visual information is processed by children 60,000 times faster. They will typically retain 80% of what they see, 20% of what they read and 10% of what they hear. So next time you ask your kid to read – think twice! Recreate a visual chart/image yourself. Colour code the information. All related concepts are highlighted using same colour. Mind map is an excellent tool to organize information. Try these tips and you will be nicely surprised to see how effectively you/your kids are able to memorise!